We can make your workflow work for you instead of against you! An efficient workflow is critical for success when your business depends on images. The principals at Imaging Answers have been designing and building efficient imaging workflows since long before the first digital camera hit the market. For us, "Workflow" means everything involved in a process. In most cases this starts with pre-sales planning to book a job and ends with long-term storage of images and resale methods. 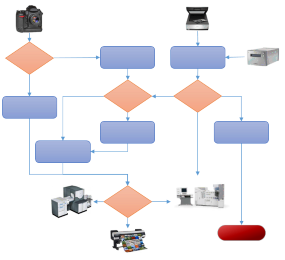 We strongly believe every workflow should be customized to fit the requirements of the business. We specialize in this customization by providing insight on the use of off the shelf products when appropriate and by developing custom applications where they make sense. Most any task that has more than one step can be automated to improve efficiency. With three decades of experience in the imaging industry, we know what can be automated and how to do it without sacrificing image quality. ♦ We often can improve initial image handling by providing a custom application to automate tasks that are done to all or part of the images from a shoot. This might include such tasks as inserting metadata, entering image information in a database, file naming and relocating, and color management based on a variety of things including camera, location, lighting, etc. ♦ We've worked with dozens of school photographers and have a deep understanding of the pitfalls and processes involved in this highly competitive business. Order prep once the prints and other items are received from the lab can especially be a drain on time and money for school photographers. We can automate some of this process and make improvements to the upstream workflow to eliminate much of the slowdown in delivering the final packages to clients. ♦ Image culling and selection is often a time consuming part of the post-shoot workflow. We can provide an application tailored to your needs to simplify the image selection process and automate post-selection tasks such as file copies, sizing, cropping, and resolution changes, RAW format conversion, metadata inserts and updates, and much more. ♦ Creating print and ancillary item orders and submitting to a lab can be frustrating! We designed order workflows for one of the largest professional labs in the country and we understand all the ins and outs of order prep and submission. We can build your workflow so this is a painless process. ♦ Long term resale is an area of workflow that is often neglected. We can design your workflow and provide the tools necessary to make sure you get those resales easily and profitably.